Are you looking for Propane Refill Bergen County, NJ? Modern Propane has been providing Propane Refill Bergen County, NJ since 1969. At Modern Propane, our company is a one-stop-shop for all your propane needs. Whether you need Propane Refill or propane rentals, we will take care of you. We are a barbeque grill superstore that fills all varieties of tank sizes from 20 lb to 100 lb tanks. We are able to top up our propane tanks in no time at all, our customers can wait for a mere 60 seconds and walk out with a full tank, ready to use that same day. We fill 33 lb forklift tanks for commercial customers who choose to bring their tanks in to our shop, or we can set these customers up for a convenient delivery instead, through JackGas our propane delivery company. We also deliver 100 lb. tanks. These are used mostly for heaters on construction sites, roofing and paving jobs, and large outdoor festivals. At Modern Propane, we also provide grill rentals, propane tank rentals or heater rentals, We have it all. We are a grill superstore that houses all kinds of products and accessories that can be used for grilling and other outdoor activities. Whether you are searching for a gas or charcoal grill, we have a wide array of both options available for grill rentals. We offer small, large and portable grills, as well as grills that provide additional space for holding and storing barbeque food and equipment. Our propane tank rentals are available in a variety of sizes, including 50 lb., 60 lb. and 100 lb. Cylinders. We also provide propane and natural gas heaters for you to rent. Our rentable heaters include vent-free heaters, convection heaters and forced air heaters. We carry tank-mounted infrared heaters and portable infrared heaters available. Our heaters can be used both indoors and outdoors, so even in the coldest weather you can still stay warm! 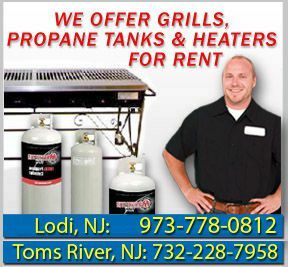 For more information on the Propane Refill Bergen County, NJ or propane products and services we provide at Modern Propane, call us at our Lodi BBQ store: (973) 778-0812, our Toms River BBQ store: (732) 228-7958, or visit us at either location.